Mackie Doyle is a replacement – a fairy child left in the crib of a human baby sixteen years ago, to replace the baby when it was stolen away by the fey. So though he lives in the small town of Gentry, Mackie’s real home is the fey world of tunnels and black, murky water, a world of living dead girls ruled by a little tattooed princess. Now, because his fey blood gives him fatal allergies to iron, blood and consecrated ground, Mackie is slowly dying in the human world. Mackie would give anything just to be normal, to live quietly amongst humans, practice his bass guitar and spend time with his crush, Tate. But when Tate’s baby sister goes missing, Mackie is drawn irrevocably back home to the fey underworld of Gentry, known as Mayhem, where he must face down the dark creatures, rescue the child, and find his rightful place – in our world, or theirs. 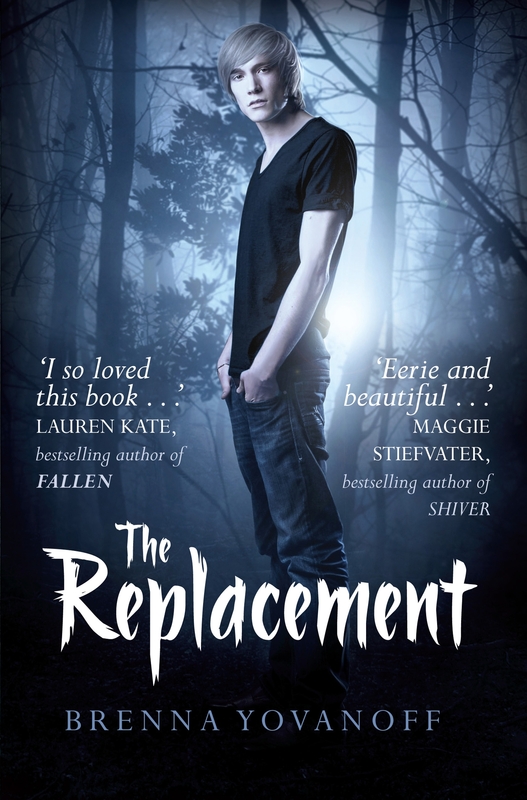 Why did I read this book: I have heard nothing but praise for The Replacement, and was excited to give it a try. The gown of Gentry is a quiet, insular place. Isolated from the woes that seem to befall other small towns, such as recessions, droughts or floods, Gentry thrives. But prosperity comes at a price, and those in the town all abide by the same unspoken rules; every few years, children disappear and are replaced. Most times, these replacements are weak and strange, and die quickly. Those that remain are singled out because of their otherness, and are the types of changelings that attract mobs, puritanical anger, and are burned. Mackie Doyle has had to follow strict rules his entire life in order to avoid unwanted attention. Although deathly allergic to iron (even the smell of it in spilled blood) and unable to set foot on unconsecrated ground, Mackie is a changeling that has, by the love of his family, managed to pass for human. But Mackie knows that something has changed for the worse, as he grows weaker and increasingly sensitive to the iron around him. Mackie is dying, and when his sister Emma barters for medicine that could save her brother’s life, Mackie discovers that there is a hidden world beneath Gentry, filled with rotting, living dead creatures with jagged teeth and cruel beauty. This world has been taking children from the town for decades, and when one last little girl is taken, the baby sister of a girl in Mackie’s class, he must decide whether or not he will continue in the silent tradition of the people of Gentry, or to embrace his nature and win the girl back. This debut novel from Brenna Yovanoff has a great deal of promise; I’ve only read one other changeling story told from the perspective of the changeling, and with a supportive family environment (the other book was The Stolen Child by Keith Donohue – a wonderful book), and the concept is delightfully unique. I loved Ms. Yovanoff’s writing as well, creating a morbid, macabre atmosphere for her dark fairy tale. I loved the idea of the insular town of Gentry, with its secrets and death things writhing beneath the surface, with a history of sacrifice and payments in blood. That said, while I felt the writing was beautiful and the idea of the book solid, the execution of the novel was a bit lacking, with a patchwork plot and uneven storytelling. The pacing felt off, too, as I found my interest waning by the midway point of the book, as it takes far too long to really get to the central conflict of The Replacement (which in itself lacks some much needed intensity and direction). More than anything else, The Replacement felt more like a vignette of striking scenes and ideas, but lacked the cohesion that could have made the book truly excellent. The saving grace for The Replacement lies with its characters. I absolutely loved the dynamic between Mackie and his sister Emma (there is a particular exchange between the siblings that made the book for me, but I won’t put it here for fear of spoilers). Mackie’s narration is also resonant, as a teen struggling for normalcy (and he’s pretty genuine as a teenage dude), but deciding to risk it all for those he cares for. I wasn’t crazy about Tate (and her interactions with Mackie were passionate, but kind of odd), and was disappointed that best friend Roswell didn’t get more of a role. Overall, I enjoyed The Replacement and will definitely check out more work by Brenna Yovanoff. don’t remember any of the true, important parts, but there’s this dream I have. Everything is cold and branches scrape the window screen. Giant trees, rattling, clattering with leaves. White rain gutter, the curtain flapping. Pansies, violets, sunflowers. I know the fabric pattern by heart. They’re a list in my head, like a poem. I dream about fields, dark tunnels, but nothing is clear. I dream that a dark shape puts me in the crib, puts a hand over my mouth, and whispers in my ear. Shh, it says. And, Wait. No one is there, no one is touching me, and when the wind comes in around the edges of the window frame, my skin is cold. I wake up feeling lonely, like the world is big and freezing and scary. Like I will never have anyone touch me again. 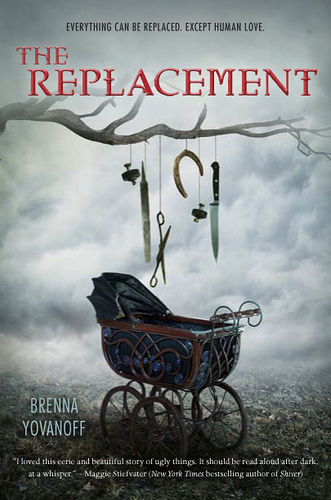 Additional Thoughts: Make sure you check out author Brenna Yovanoff’s guest post for a chance to win an autographed copy of The Replacement! *the cover on the LEFT freaks me out, not the one of the right. I’m totally cool with backlit, jeans-clad boys. I love the review! So eerie! This book’s on my TBR, and I don’t even read horror, but it was the cover – the creepy cover on the left – that made me go ‘this looks interesting’. The right cover makes me shrug – oh, look, another mysterious teen boy~ haven’t seen a million of those covers around… 😉 I’m glad to hear the book itself is pretty decent. I’ll bump it up on the list. I enjoyed this one and felt about the same way. It was good but could have been a bit better. Wow, LOVE the US cover, but not so fond of the UK one. Usually it’s the other way ’round for me! I adore changeling stories, and tales that put the fae in a dark light, so even if it’s uneven, I need to read this. I love the US cover – it’s what made me buy the book – but I find that the UK cover is more fitting for the book. I was hoping for something creepy and haunting like the book by Keith Donohue (which is WONDERFUL) but instead I find this book to be a bit pop goth (a term which I admit doesn’t exist and may be inappropriate, but it’s the only way I can think to describe the book for myself). It is a horror story confuse but it is the best book a have ever heard in my entyre life. Cheers for Brenna Yovanoff. It is a horror story confuse but it is the best book a have ever heard in my entyre life. Cheers for Brenna Yovanoff. It is a good book not a good book a spectacular book.